We're talking about trees...................AGAIN! The issue of trees is just one of those things that always has been, and always will be at Tacoma. Actually, I take that back. I'm sure in the beginning, there was very little issue with trees. First of all there was hardly any trees on the property, which is why this parcel of land was selected for the golf course. After all, the Club's founders were a bunch of Scots who wanted to play golf here in their new home, because they missed the game which they loved playing back at their homeland. Of course all they knew at that time was links golf since the idea of playing golf on any other land other than "links land" was relatively new. In fact, a couple of the Club's founders graduated from St. Andrews University. They played countless rounds at the home of golf. I think it's safe to say they were linksters (one who loves to play golf on the links). I'm not making this up. 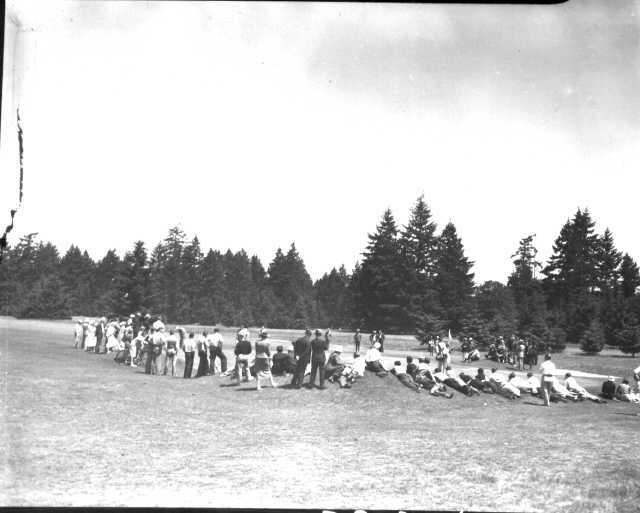 Here is the earliest photograph of the course at Tacoma C&GC. 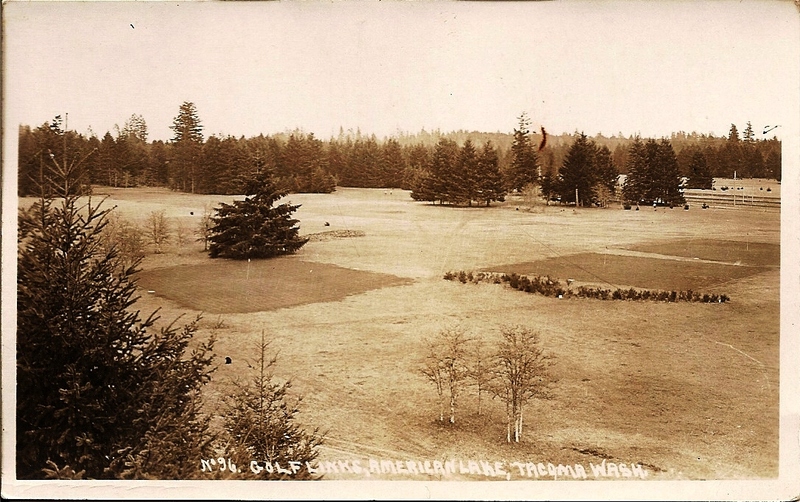 Notice the text on this photo even says "golf links, American Lake, Tacoma Wash". It is estimated that this photo was taken sometime around the early 1900's, and certainly before 1923. That would be about the same time Harry Vardon and Ted Ray played an exhibition match with Jim Barnes and Robert Johnstone at Tacoma. 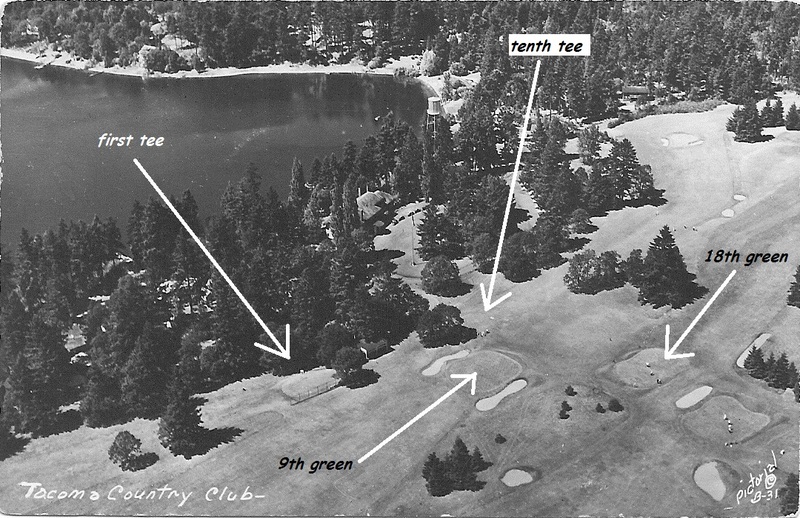 Barnes was Tacoma's Pro at the time and Johnstone was Seattle Golf Club's Pro. If I have to tell you who Vardon and Ray were, then you're probably already bored with this information and I encourage you to just skip to the next paragraph. The match was played November 4th, 1913 and you can imagine the excitement around the Club for this event. I'm certain everyone came out to see these celebrities duke it out on the links. To put it in perspective, it would be like if Tiger and Phil came out to play at Tacoma today. Vardon and Ray were the biggest names in golf at the time. The match here at Tacoma was just two months after Vardon and Ray were bested by Francis Ouimet in arguably one of the most famous Open Championships of all time. Vardon (a five time Open Champion at this time) and Ray (who won the Open just a year earlier) had something to prove.........and they did. They bested the Northwest pros in both matches. It's possible that the picture above was taken in 1915. If so, this is how it looked when Walter Hagen and Jim Barnes teamed up against Willie Leith (future head pro at Tacoma) and Robert Johnstone. Barnes and Hagen, not surprisingly, sleighed the young guns 6 up in the first match and then finished all square in the afternoon duel. When Hagen was here for that match, he was the current US Open champion. You can imagine that event drew quite a crowd. Now look at this picture from the 1930's. This is what it looked like when a young Babe Zaharis played a round at Tacoma with Mrs. Horace Wright. It's possible that at this time, "trees" might have been an item you would have seen on the Green Committee agenda. Only I'm guessing at this time they were talking about where to plant them, as is clearly evident by the new young trees at the bottom center of the picture. Shade still wasn't a huge issue. This was a time when many golf clubs in America were planting trees because the belief was that they were beautifying the golf course. Well everyone has a different opinion of beauty. I personally think trees are beautiful. I personally love trees. But, I don't like trees growing over the gutters of my house, and I would rather not have tree roots undermining the foundation of that house. I also don't like trees shading my vegetable garden. Growing good tomatoes is impossible without full sun. It doesn't matter if you're a bad gardener, a good gardener, or a brilliant one. Growing good tomatoes without full sun is impossible because of the nature of the tomato. Some might not think that is a fair analogy, but it is. As Superintendents, we're not just asked to grow grass, we're asked to grow amazing grass. If we were asked to grow tomatoes, it would be expected that we need to grow the kind of tomatoes that will win ribbons at the fair. By the way, those same little trees in the picture above are the ones in the center of this photo taken the other day. I'm certain the folks who planted those trees never imagined that their actions would someday be ruining the 18th green, but that's whats happening......ever so slowly. This picture was taken at 10 am in June. The right side of this green has not seen any morning light and it won't either. It lives exclusively on afternoon light and this is why it is slowly degrading in quality. It's this kind of situation that we see in many areas of the playing grounds. Anyway, I'm sorry for getting side tracked with the Club History, but it's significant. 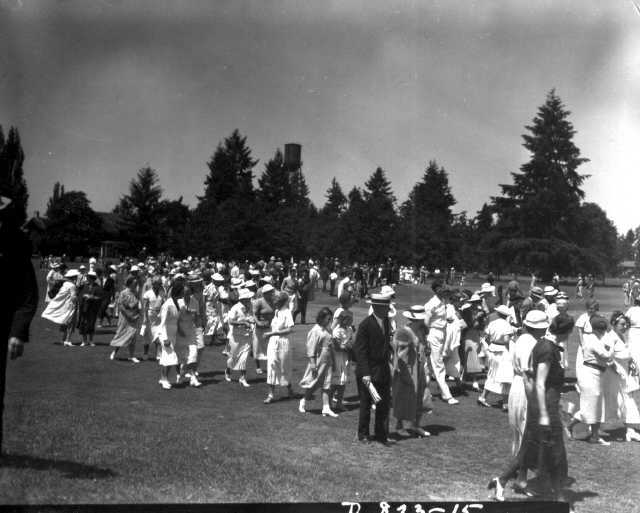 It's significant because the grounds at Tacoma started out as open prairie, perfectly suited for golf in those days. In those days golf was played along the ground. The ground needed to have good turf for this style of play. 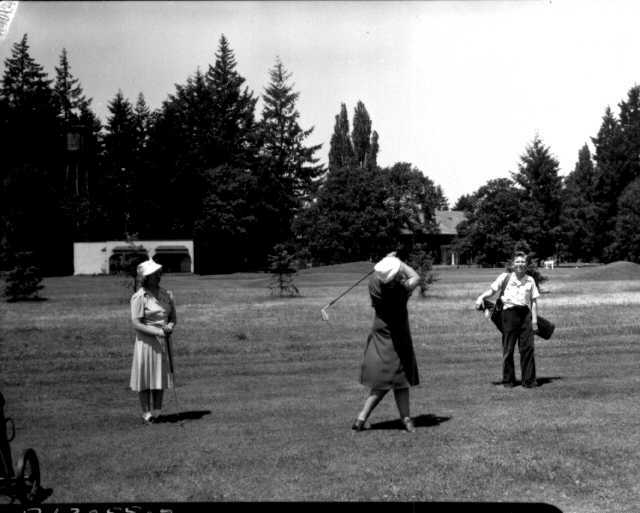 Clearly, to attract the worlds best players like Barnes, Ray, Vardon, and Hagen, the grounds at Tacoma must have been some of the finest for golf. ........................This is no longer the case. 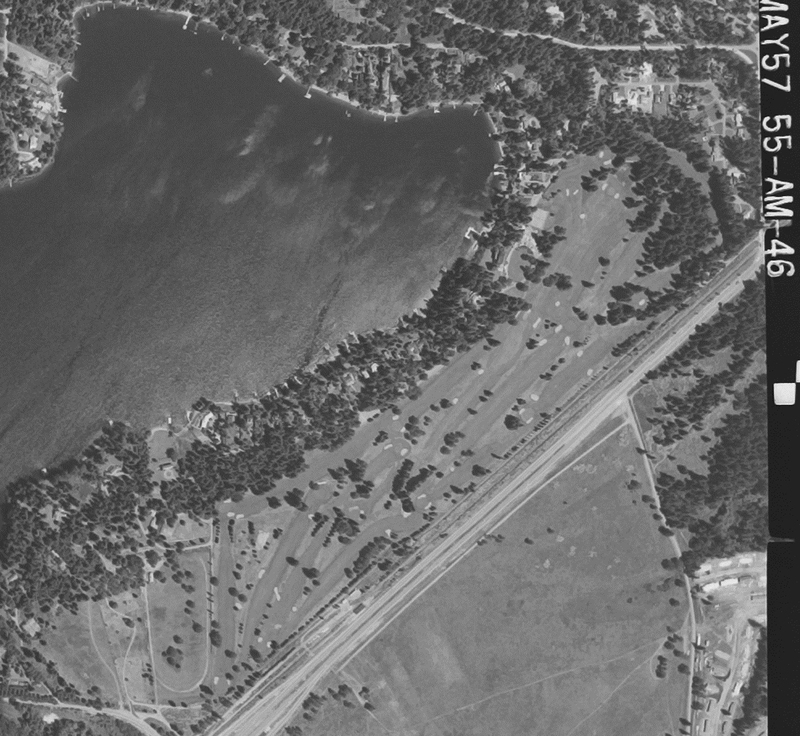 In this aerial from 1957, you can really see some of the trees that have been planted and that don't appear to serve any function. It's hard to know why someone planted them. If we could find the minutes from those early committee meetings, we might be able to piece together the reason, but it isn't relevant. What matters today is the golf course is being compromised. What matters today is that all plants can be both desirable, and undesirable. Trees that don't serve a function and cause turf damage are plants that are no longer desirable and therefore would be categorized as weeds. When we are talking about the Tree Management Plan (TMP), we really are talking about a form of weed control or weed population management. Managing these large plants is serious business. Removing them cost money, but keeping them costs much more. Please click HERE and read up on the hidden cost of trees. Here is the first green at 10 am just the other day. We removed 17 large firs in this area a couple years ago and that made a significant improvement. But this green still remains our weakest green overall so more work is needed. This is the new 6th tee at 10 am the other day. This isn't even worth discussing in my opinion. The entire tee is under shade and even in this picture you can tell the turf is struggling on the left side near that row of firs. I could show hundreds of pictures like this but I think you get the point. Some trees have simply grown too large. Some trees should never have been planted in the first place. Some trees are shading out our endangered oak trees. There are several reasons why a tree might need to be removed. Right now if you go out on the playing grounds, you will see the Committee has marked several trees with orange ribbons. If a tree has one ribbon, it is slated for removal. If it has two ribbons, it is to be removed and replaced with a tree that is more suitable for the space which it occupies. If the tree also has a blue ribbon, that means the Committee is considering relocating it to a place where that tree might look more appropriate. Please I encourage you to look at the marked trees. If you can't see why it would be marked, don't hesitate to contact me. I will personally meet with anyone on the course if they would like to discuss any of the marked trees. And, if you don't already know, we are having an all member meeting on June 20th to discuss any issue you are concerned with. Please attend if you would like to understand the details of the Tree Management Plan or any other issue on the master plan. I hope all of you are there for that meeting. There's nothing better than having everyone on the same page and I'm certain once you see and hear the details of the master plan, you will be supportive. You will be supportive because it is really about getting back to our roots. This course is rooted in the fact that it is a wonderful ground game golf course, like most of the wonderful classic courses that were built in the "golden era". Over the years, trees have shaded the course and crowded out the open feel that it once had. The shade has made many areas thin, and damp so the ball doesn't bounce like it should. 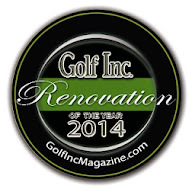 Now that the bunker renovation is complete, the course is more interesting and more fun than ever before. Now that it is almost 7000 yards from the tips, it has teeth again. It can bite you, just like it bit into Vardon, Ray, Hagen, and our own pro "Long Jim Barnes". If we can address the trees, then we can finish the job of taking Tacoma C&GC back to its roots. Back to the day when it was the finest test of golf in the region, and the turf was firm, and fast from tee to green.